Because it didn't include instructions was one of the reasons it didn't make the roundup. However, I couldn't get past the clever cut/fold technique. This led to a quick sketch on a scrap piece of paper, which I used to create three templates of varying sizes. I thought they'd be perfect for some 'standing' decorations for mantels and such. The plan was to include said templates in this post for all my fellow Curbliers to use. But then a monkey was thrown into the wrench. Between the time of creation and planned posting date, I discovered a template for the card, which is being offered for sale at Card Carousel. So, ethics being the Debbie Downers they are, I couldn't post my version of the template here. But I couldn't NOT share the inspiration, because, you could easily modify their template, or--like me--make your own. First, all you need is some pretty card stock or heavy scrapbook paper, a scissors, a ruler, and a pencil. Using the Card Carousel template (or the one you make), trace the tree shape onto the card stock/heavy scrapbook paper and cut out. Then, using the ruler, fold two lines from the top point to the two bottom points. Fold up both sides of the tree and 'weave' the branches together. Then decorate as you see fit. I decided to use a bit of tacky glue to glue pompoms, which I dyed with ink pads, to the tips of the branches. 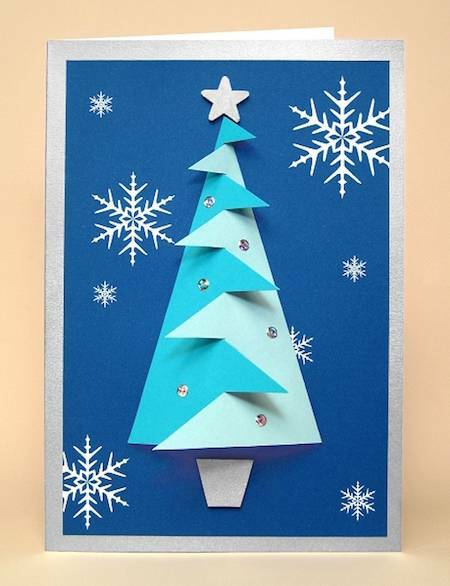 If the tree pops open a bit too much, you can add a bit of hot glue at the inside folds--but DO NOT press too hard or else your tree will become too flat and not stand. I love them, and, if you do too, I hope you give them a shot! Drats, I wish I had seen this in October! Now to try and stash it where I'll remember it for next year...thanks!